If you fear that you may be toeing the line of tiring out your nearest and dearest with all your wedding talk, we’ve got some advice on how to have your wedding cake and eat it too! 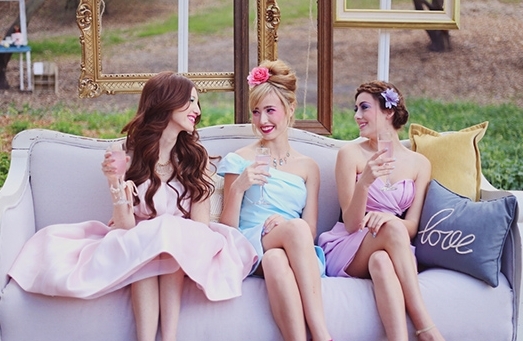 If you’re worried that you’re gabbing on too much about your big day, allow your friends to talk first. Let them vent, ask them what’s going on in their lives, and take a genuine interest in what’s on their mind. They’ll feel satisfied that you managed to talk about other non-wedding related topics, and will most likely reward you by asking you how planning is going. THIS IS YOUR GOLDEN TICKET; TAKE IT AND RUN WITH IT! 2. Acknowledge how much you’re talking about it. It’s not that you’re annoying as a person (you’re great, and your friends and family know that too), but talking about your wedding constantly can be a bit tiresome, and yes, annoying. Let your pals know that you’re self-aware and that you realize that all the wedding talk isn’t always fun for everyone else. Your pals will be relieved and appreciate your ability to poke fun at yourself. 3. Be choosy about what you share. Your friends don’t need to hear every last detail about how you searched for rehearsal dinner invites but couldn’t find any in your colors so you tried another website and then just ended up going with the first ones you found because you realized they didn’t have to match perfectly…NO. Share the important milestones and remember that no one cares about the mundane details as much as you do. 4. Hang up your humblebrag hat. Yes, wedding planning is stressful, but not every aspect of it is a state of emergency…so sometimes when you complain about it, it’s going to sound like a humblebrag. So before you start complaining about the fact that your engagement ring is just too big, don’t lose sight of the fact that you’re getting married, and that’s a huge blessing no matter the fine print of the planning. 5. Remember: chocolate never fails. If you know you’re going to talk your pal’s ear off about the wedding, come bearing goods! Whether it’s chocolate or champagne, a simple “thank you for listening” treat will make everyone happy to see you, even when you’re in super-bride mode.